Founded in 1904 and therefore the oldest of the city's symphony orchestras, the London Symphony Orchestra became world-renowned for recordings that date back to early gramophone records in 1912. Amid decades of diverse classical programming that followed, including performances for radio and TV, the orchestra also became known for its appearances in numerous film scores, including the Star Wars series. The LSO also tours and first visited North America in 1912 (narrowly avoiding passage on the Titanic). The ensemble's direct antecedent was the Queen's Hall Orchestra, formed in 1895 for conductor Henry Wood's series of Promenade Concerts. The summer series was so successful that a series of weekly Sunday afternoon concerts was established the same year. The orchestra, however, had never become a permanent group; its members could and often did send other musicians to substitute for them at concerts. In 1904, Wood attempted to end this practice, prompting 46 members to leave and form their own orchestra. 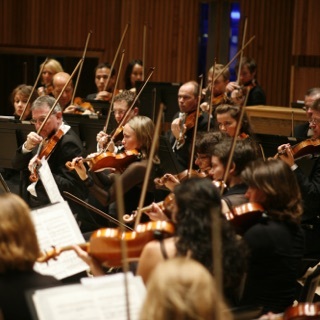 The London Symphony Orchestra was organized as a self-governing corporation administered by a board selected by the players. They arranged for the great Hans Richter to conduct the inaugural concert, and continued to engage a variety of conductors, practically introducing the concept of the guest conductor to the London musical scene. Soon, though, the title and post of principal conductor was established for Richter. The LSO's connection with the BBC goes back to 1924 when Ralph Vaughan Williams conducted the orchestra in the premiere broadcast performance of his Pastoral Symphony. It was the unofficial orchestra in residence for the BBC until the formation of the BBC Symphony in 1930 and continued to broadcast concerts and provide background music for many BBC productions. Other conductors most associated with the orchestra's first few decades include Edward Elgar and Thomas Beecham. During World War II, Wood was welcomed for a series of concerts. The War took its toll on orchestra membership as it had the general populace, and a concurrent drop in private funding led to increased reliance on the state arts council. This eventually led to structural reorganization in the 1950s, resulting in increased professional standards and the abandonment of profit-sharing; players became salaried employees. The revamped orchestra made only its second tour of the United States in 1963 (the first had been in 1912), and in 1964 embarked on its first world tour. In the mid-1960s the city of London broke ground for the Barbican Arts Centre, intended as the LSO's permanent home. The building was an architectural and acoustic success, and since 1982 has provided the orchestra the solid base it lacked during the first 70-plus years of its existence. The venue opened under principal conductor Claudio Abbado, who took over for André Previn in 1979. In the meantime, the orchestra made its Star Wars debut, performing John Williams' score for the original 1977 film. While the organization had recorded its first film score in 1935 (H.G. Wells' Things to Come) and appeared in such classics as The Bridge on the River Kwai, Doctor Zhivago, and The Sound of Music, Star Wars won three Grammys, an Academy Award, and a BAFTA, among many other accolades, sold over a million copies in the U.S. and over 100,000 in the U.K., and endures as a touchstone in modern film music. The LSO went on to record music for the franchise's entire first two trilogies as well as films like 1981's Raiders of the Lost Ark, 1993's Schindler's List, 1997's Titanic, and select installments of the Harry Potter series. During the tenure of Colin Davis, who was named principal conductor in 1995, the LSO established its own record label, LSO Live. Dvorák's Symphony No. 9, recorded at Barbican Centre in 1999 and released in 2000, bears catalog number 0001. Their 2000 recording of Berlioz's Les Troyens won two Grammys in 2002, and Verdi's Falstaff took home the Best Opera Grammy in 2006. 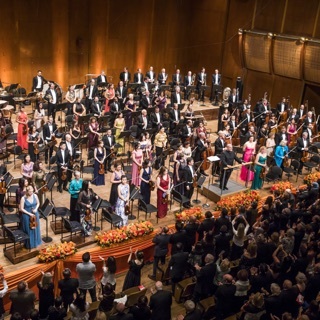 In 2007, Davis took the position of orchestra president, its first since Leonard Bernstein's passing in 1990, and Valery Gergiev became principal conductor.